1. Blend all ingredients (except dedicated coconut and water) in a high speed blender. This could take a little while depending on the power of your blender. Ours take 2 mins in Thermomix and I stop it a couple of times to scrap the sides down. 2. Slowly add water if you need it. If mixture is a little crumbly and you want to bind it. This will depend on the dates. 3. Put your desiccated coconut into your container ready for your balls. 4. Roll each ball and add to the coconut. 5. Once all balls are rolled, put lid on the container and shake and turn container gentle. – you really can change the ingredients up in these. If you have nuts, add some. If you are allergic to coconut than swap it for something else and roll the balls in chia seeds or cacao powder. 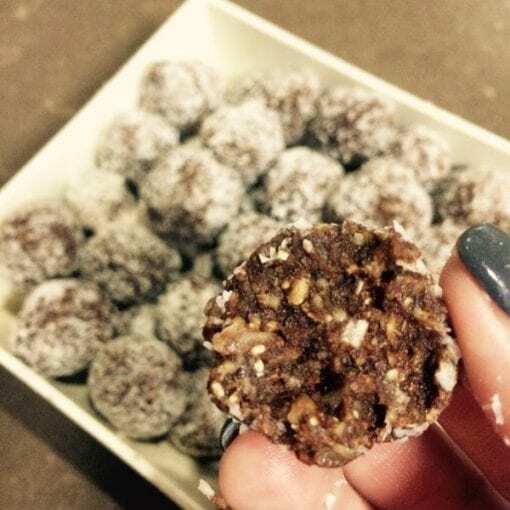 -If you want to hide the seeds and make them look like plain chocolate balls, blend all seeds first to a powder and then add and mix all the other ingredients as above.